The best gift you can offer to make a difference in the lives of other is: a good conversation. Conversation is a therapy that can improve your relationships, be it personal or professional. It not only strengthens your bonding with others, but also helps the listeners, de-stress themselves. The first and foremost rule of being a good communicator is to gain prowess in your area of expertise. By this, the main focus should be your forte in which you are dealing. For say, if you are a project manager, gain complete knowledge of the work so that you are in a position to answer the queries of your team members and juniors. As a manager/employee, you must be well versed with your duties and responsibilities so that whenever you are questioned about your role, you have ample substance to justify your contribution. 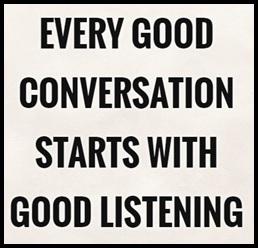 Seconding this quote, the power of listening cannot be underestimated. Until and unless you aren’t aware of the queries and qualms of your peers, juniors or colleagues, you will never be able to deliver the right argument. Ones, who listen, can only keep the listeners hooked to conversation. If you speak something, that doesn’t offer value to the listeners; your conversation will remain a pseudo talk. When you conduct a meeting, do clarify its objective. When you approach you manager, do clarify your grievances. In a nutshell, don’t talk the long way. This will neither help you or the other person. Your message will remain unclear and you won’t reach a viable solution to the existing problem. A seamless conversation is only possible when you open up about your ideas and don’t hide the important links under the wraps. An English philosopher, Herbert Spencer, once said “opinion is determined by the feelings and not by the intellect”. Taking inspiration from this quote, as a good communicator, do not negate the opinions of others. It’s their view or perception of looking at situations or things. Rather than getting too much involved in countering the other person, focus on the main idea of the conversation. If you let the talk being dominated by the justifying the opinion of others, the essence of communication will lose its sheen. As a good communicator, understand and accept the fact that ‘not everything can be put into words’. People might not disapprove your idea outright, but they will express non-verbal cues which only a watchful person can comprehend. So while conversing, keep an eye on the body language of listeners. This will help you take the conversation in right direction. For a positive communication to take place, non-verbal communication plays a more active role than verbal communication. A feedback is an affirmation that seeks the approval of listeners. A refined communicator will never leave the room without seeking the feedback. The mental satisfaction of the listeners must be the core of your communication. Moreover, it is another form of assurance that the discussion was meaningful and has added value to the existing knowledge of the listeners. A good communication is an art which can be groomed with patience and experience. Even if you lack this skill, you can acquire it with little effort and care. This skill will be 100 per cent instrumental in your career growth. It is because people admire having a leader or manager who has tremendous capacity to listen than just talk. For more interesting insights and trivia about career aspirations and life, keep visiting Career Section of jagranjosh.com. You can also subscribe with us to stay abreast with tips on managing your career without a hitch. How to pick the right IT certification course? How to Build an effective LinkedIn Profile?